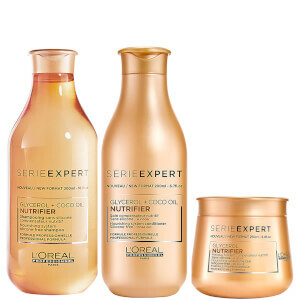 Envelop your hair in healing nourishment with the L'Oréal Professionnel Serie Expert Nutrifier Shampoo and Masque Duo. The haircare pair helps to replenish hydration in order to seal split ends and bring back a healthy-looking shine. Shampoo: aplique uniformemente no cabelo molhado. Faça espuma. Passe bem por água. Em caso de contacto com os olhos, lave-os imediatamente. Máscara: aplique uniformemente no cabelo lavado com shampoo e enxuto com a toalha. Deixe atuar durante 1 minuto. Enxague abundantemente. Masque: Aqua / Water, Cetearyl Alcohol, Glycine Soja Oil / Soybean Oil, Behentrimonium Chloride, Isopropyl Alcohol, Phenoxyethanol, Glycerin, Caprylyl Glycol, Benzoic Acid, Bht, Linalool, Hexyl Cinnamal, Limonene, Benzyl Salicylate, Arginine, Glutamic Acid, Benzyl Alcohol, Serine, Hydroxypropyltrimonium Hydrolyzed Wheat Protein, 2-Oleamido-1,3-Octadecanediol, Ci 19140 / Yellow 5, Ci 15985.